Now 4 sets scrap tyres to oil production plant machinery have all been installed successfully. Both parties are satisfied with this installation. Congratulations !The customer wanted to build the scrap tyres to oil production plant machinery in a formal industrial park in HuBei. Owing to the strict environmental request, only no exhaust pollution used tyre pyrolysis plants could do this. That’s why he choose DOING as the partner. With the information provided by DOING, this customer passed the environmental impact assessment process soon.Now the equipments have been formally put into production. What they will get from the abandoned tyres are very valuable energy like fuel oil, steel wires, carbon black, and combustible gas. 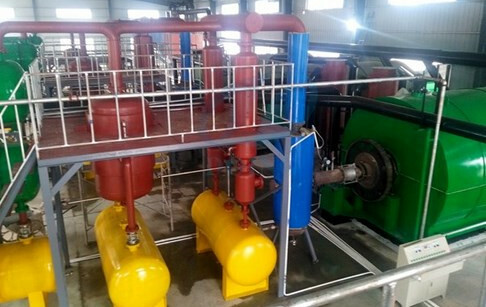 4 sets 10T/D used tyre pyrolysis plants can handle 40 tons of tyres a day, bringing the customer about $8,000 a day in profit.The customer is very satisfied with scrap tyres to oil production plant machinery. If you wanna to get more details about 4 sets scrap tyres to oil production plant machinery installed in Hubei, China you can send E-mail to market@doinggroup.com. You can consult our professional engineer and specialized sales team with leave a message in below form.We will contact with you ASAP.You also can visit our factory in Henan,China.Get Detailed address.